This is a particularly affecting work in its original quartet form and I often wonder why the Hungarian-born American conductor George Szell felt that he would like to orchestrate the work for the Cleveland Orchestra. The melodic and rhythmic excitement and distinction of the work lends itself to this approach of course. Certainly the Orchestra of the Karol Szymanowski Philharmonic in Kraków under Charles Olivieri-Munroe achieved great splendour. However in the process my personal feeling is that the original intention has been transformed, not always positively, in the inflation to grander proportions. Smetana was afflicted with tinnitus (the perception of noise or ringing in the ears - touchingly represented when the violin plays a high harmonic E towards the conclusion of the piece), a premonitory indication of the deafness that would eventually afflict him. The quartet was intended to be an intimate conversation between friends depicting scenes or periods from the composer's life. It was premiered privately in Prague in 1878. 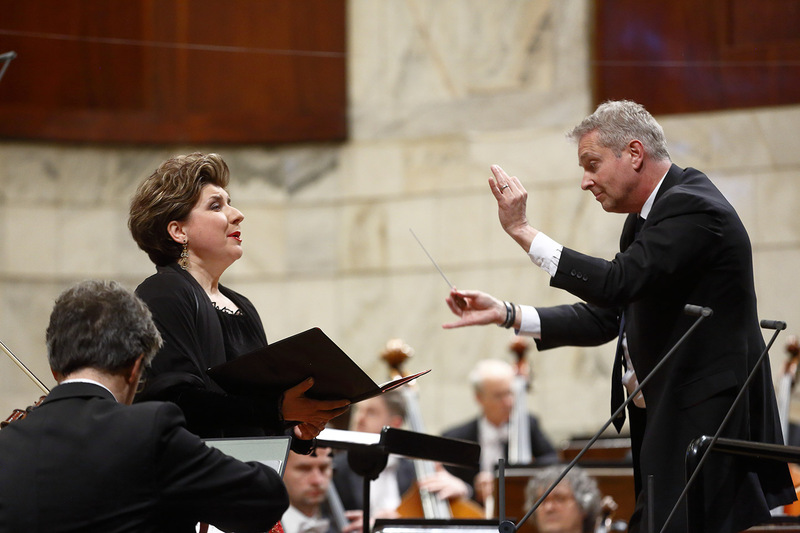 The Allegro vivo appassionato was an exciting ride with this orchestra and conductor. However Smetana wrote: 'The first movement depicts my youthful leanings toward art, the Romantic atmosphere, the inexpressible yearning for something I could neither express nor define, and also a kind of warning of my future misfortune.' The orchestration lifts his life to declamatory heroic status rather than exploring the intimate passional level, which seems to me the more introverted intention of the quartet. 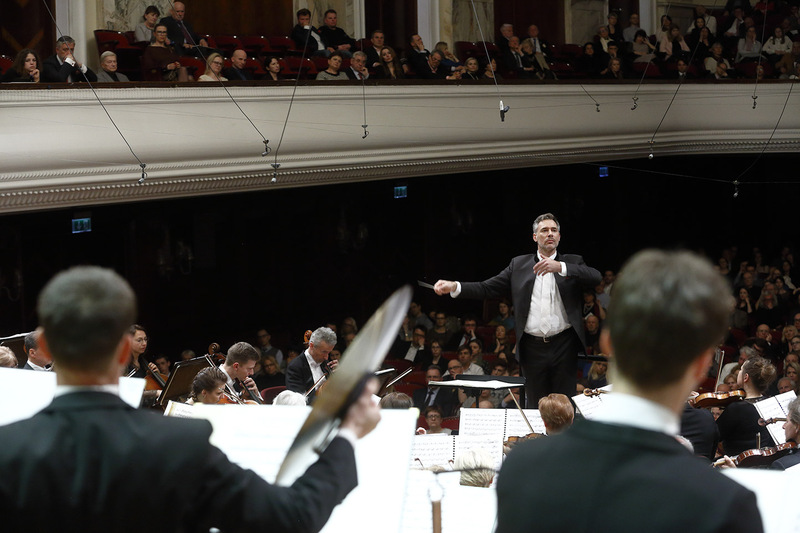 The second Allegro moderato à la Polka reflects Smetana's passion for dancing and is full of youthful exuberance. 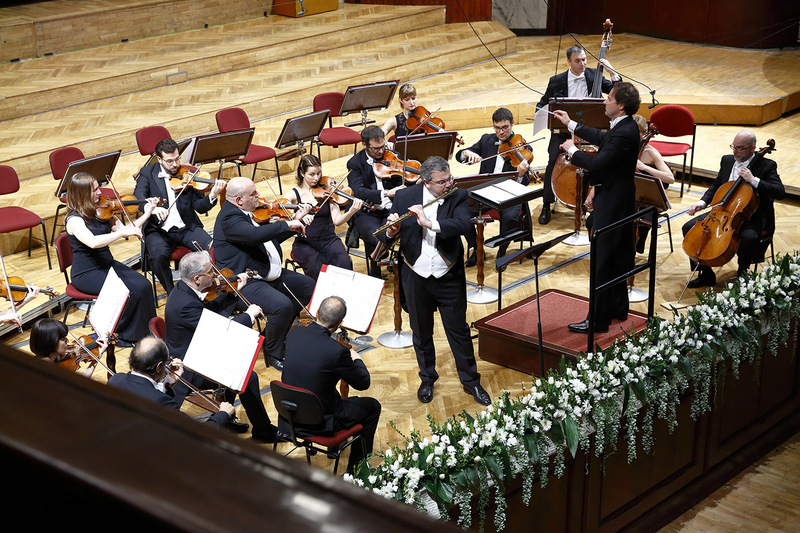 The orchestra and Olivieri-Munroe invested the movement with an infective ebullience. Of the third Largo sostenuto movement Smetana comments: '...[it] reminds me of the happiness of my first love, the girl who later became my faithful wife.' I felt the moving emotional intimacy of the quartet was somewhat lost in the orchestrated version, however affectingly enough performed. In the Vivace final movement the nationalist rhythms and melodies benefited greatly from the orchestration, however I fear the extraordinary and touching 'tinnitus reference' (an appalling temporary affliction I have experienced ) was not nearly as effective as in the quartet. This orchestral performance with the imaginative and colourful conducting of Olivieri-Munroe was energetically convincing overall but I confess to mixed feeling concerning the orchestration of the quartet. These sublime songs for orchestra and soprano are a poetic close to the illustrious career of Richard Strauss. He composed them in 1948 when he was 84. They are his last completed works apart from the song Malven. They were published posthumously in 1950 and given the title 'Four Last Songs' by the publisher. 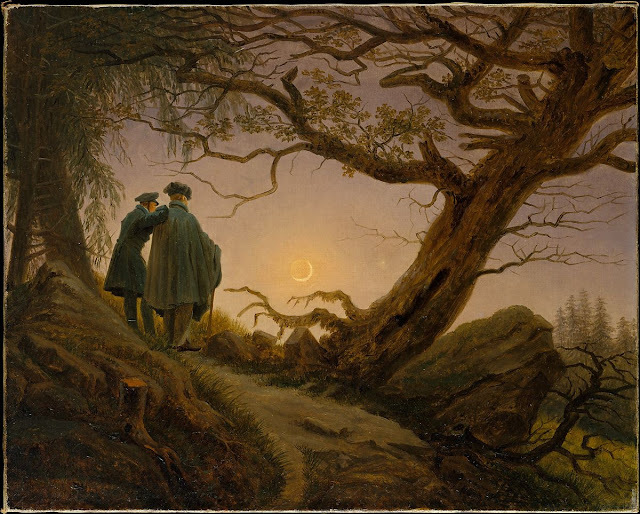 Strauss was deeply moved by the poem Im Abendrot (At Sunset) by the Romantic Prussian writer Joseph von Eichendorff (1788-1857). He felt it related directly to the sunset of his life with his wife Pauline de Ahna. Strauss described her as 'very complex, very feminine, a little perverse, a little coquettish, never like herself, at every minute different from how she had been a moment before'. She died only eight months after Strauss in May 1950. He was also inspired by the poems of the German poet, novelist and painter, Hermann Hesse, as I have been all my life. The distinguished Munich-born soprano Anna Gabler has a deep experience of singing Strauss in various roles in Elektra, Arabella, Capriccio, Salome with the Vienna State Opera during the recent 2017/2018 season. She gave a fine and inspiring performance of these transcendent songs which lifted us into an ethereal world of spiritual harmony. The poems Spring, September and Going to Sleep are by Herman Hesse whilst At sunset is by Joseph von Eichendorff. dreamily into the light air. Come close, and let them fly. so deep in the evening's glow! Is this perhaps a hint of death? The work is structured like a four-movement symphony. The opening Allegro con fuoco is rich in the joyful energy of heroic self-confidence, expressed convincingly and engagingly by the Karol Szymanowski Philharmonic and Charles Olivieri-Munroe. Needless to say the hero suffers periods of melancholy and grief (actually including a funeral march) but returns to life in the dancing scherzo which leads into a mood of triumphant victory once again in the splendidly ostentatious coda. 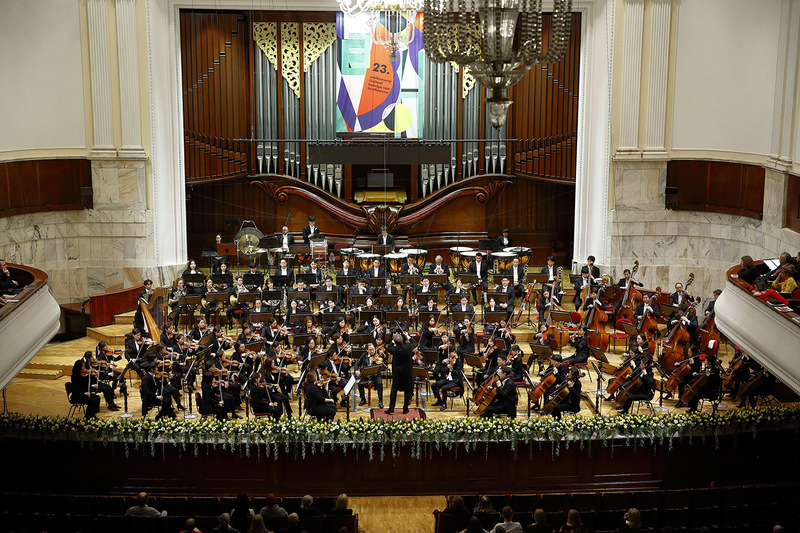 The orchestra and conductor communicated the visceral rhythms, timbral colours and driving energy admirably. I cannot say I am in love with this work but it is certainly effective if rather too bombastic at times - for my taste. I VIRTUOSI DEL TEATRO ALLA SCALA are an asserted ensemble of musicians, all members of the Teatro alla Scala and the Filarmonica della Scala orchestras, who wish to perform together and by doing so to share their common musical experience, collected over the years through the collaboration with some of the World’s greatest conductors. To obtain the highest artistic quality possible, the group is composed of first class musicians, including many solo parts who have all obtained international recognition. [Gemi Art & Entertainment]. This was a particularly charming concert that made few musical demands on the listener apart from giving oneself over to the pleasure of hearing familiar works performed by a group of musicians who could not be more familiar with them! An opportunity to simply luxuriate in famous operatic melodies and a film score by Nino Rota - an inspired choice. Luchino Visconti’s The Leopard is close to being my favorite film of all time and certainly Giuseppe de Lampedusa's novel Il Gattopardo is one of the finest literary masterpieces written in any language. Images and memories abounded during the Rota music film score. 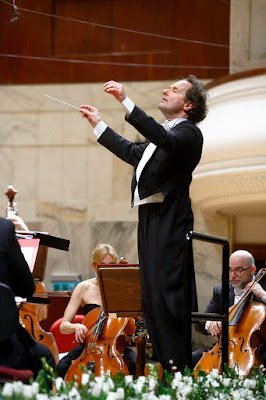 This rendezvous was achieved under Massimiliano Caldi a handsome Italian conductor who effortlessly seduced the audience with charm and talent. 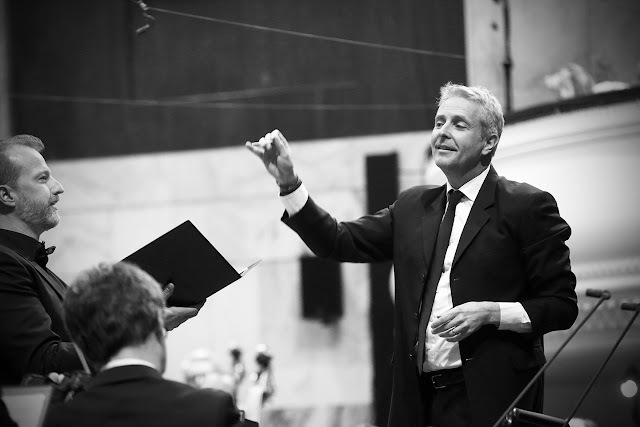 Winner of the first prize at 'G.Fitelberg' International Competition (1999), Caldi is Principal Conductor of the 'A.Malawski' Podkarpacka Philharmonic of Rzeszów and First Guest Conductor of the Polish Baltic 'F.Chopin' Philharmonic of Gdańsk (Danzig). 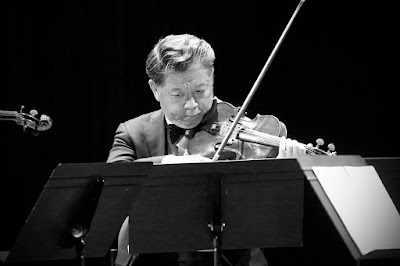 He has appeared on many musical juries, international festivals and travelled widely on world musical tours. 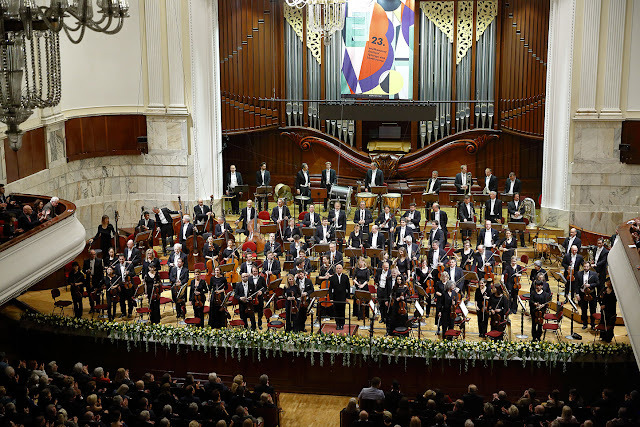 As a long encore they played an original baroque suite composed and dedicated to the Artistic Director of the Beethoven Festival, Elżbieta Penderecka. At Westminster College on 5 March 1946 Winston Churchill made a speech that created in the mind a barrier across Europe. The words are well known but some implications are not fully realized. One must always remember that the 'Iron Curtain' was a cultural as well as political barrier. This meant there was little cultural osmosis across it in either direction apart from what had already taken place before the war. This accounts for the ignorance in Western countries of much music from these Central and Eastern European states which is only now beginning to surface. Discovering one's politically suffocated historical and cultural heritage is a deep draught of the heady elixir of freedom. This is one of the positive excitements of the present in Poland yet one must guard against distortions of judgment, both positive and negative, that come from cultural elation. 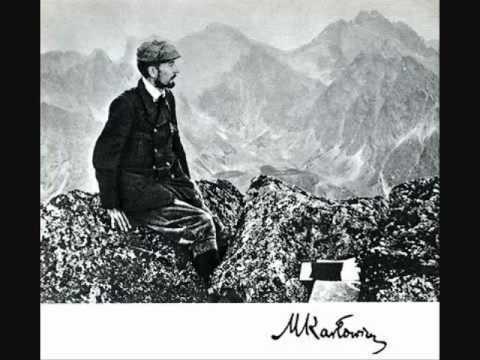 Mieczysław Karłowicz pursuing his passion for mountain climbing in the High Tatras (listening to the aspirations within his compositions) before his untimely death in an avalanche. Although familiar enough to musically educated Poles, the precocious late Romantic composer Mieczysław Karłowicz [1876–1909] who died in an avalanche at the tragically young at the age of 33, is relatively unknown outside the country. Certainly his work is not sufficiently familiar to me to write in informed detail about it. His six symphonic poems cause him to be considered Poland's greatest symphonic composer. At the time opposition to his compositions was violent. The music historian Aleksander Poliński wrote of young composers that they '...have now been affected by some evil spirit that depraves their work, strives to strip it of individual and national originality and turn into parrots lamely imitating the voices of Wagner and Strauss'. Karłowicz's compositions were regarded as 'modernistic chaos' which made them unpopular with the Polish public. I am afraid these delightful, rather light-weight songs sung by the renowned Polish dramatic mezzo-soprano Małgorzata Walewska were quite unknown to me. She herself is a Polish cultural icon having been awarded the highest Polish distinction for contributions to the arts and culture known as the Gloria Artis. On the list of the American TIME magazine in 1999, she was included among the ten most famous Poles as '...one of the stars that illuminate the way for Poland in the next millennium.' I found them engaging and charming and the series chosen were touchingly interwoven with small orchestral interludes which may have been Karłowicz 'Songs without Words'. She has a rich and eloquent voice, together with a poetically theatrical delivery of the greatest charisma. 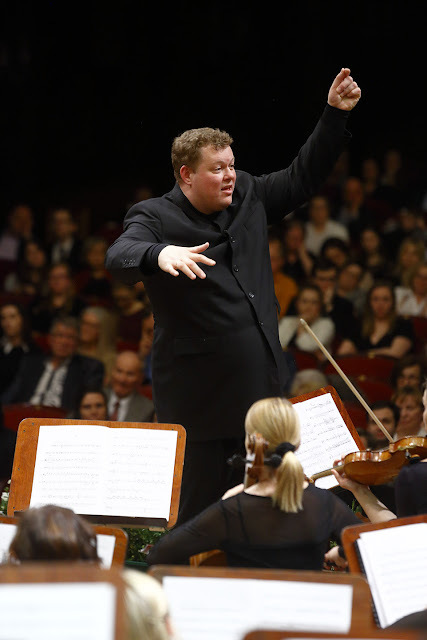 The conductor Rune Bergmann was extraordinarily engaging with the audience, orchestra and soloist during this work. One felt the quite unique feeling of a molto sympatico person in his presence. 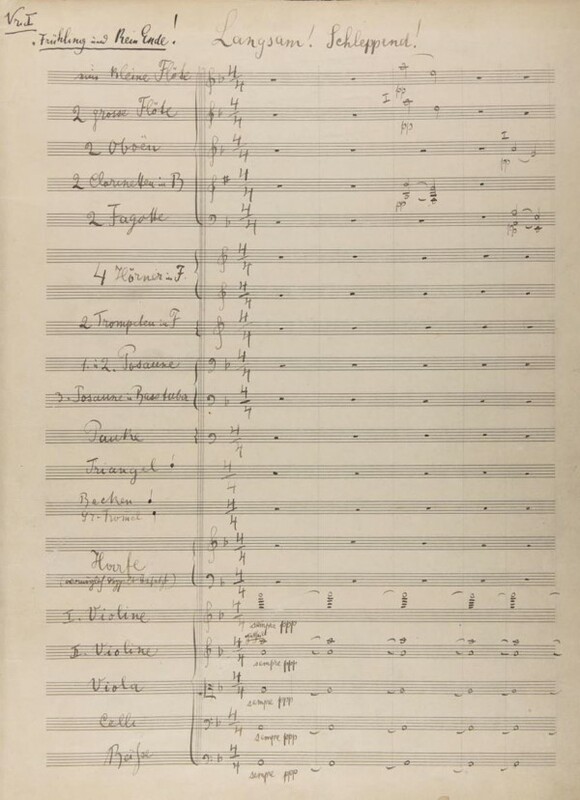 This tremendously impressive orchestral piece in four movements was composed between 1899 and 1902. The premiere took place on March 21, 1903 in Berlin, and the Polish premiere on April 7, 1903 in Lwow in present day Ukraine. Before the Polish premiere the composer gave a comprehensive literary programme of the work in the Lwow newspaper Słowo Polskie, in which he referred to each consecutive movement of the Symphony. It is rather in the form of a symphonic poem. 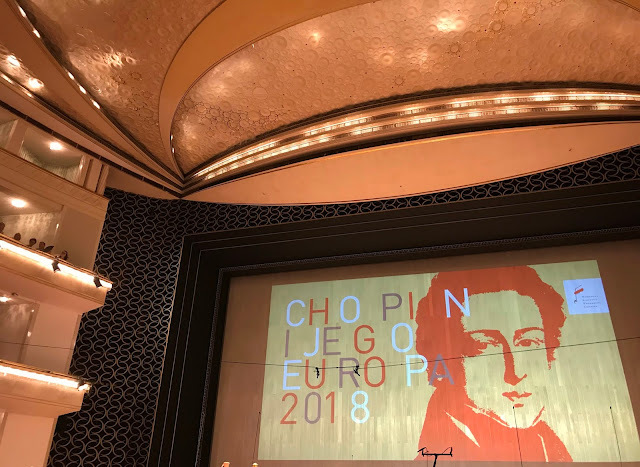 So rather an educational concert for me, exploring songs and the most significant Polish instrumental and orchestral music between Chopin and Szymanowski. I felt Karłowicz to be a major composer whose creative work was brutally interrupted by Nature in an avalanche whilst pursuing his understandable passion (listening to the aspirations within his compositions) of mountain climbing. 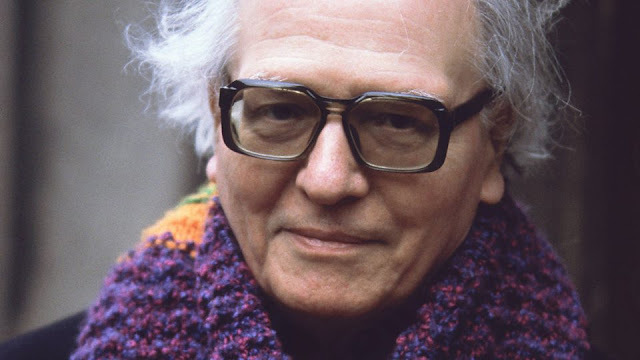 I will never forget the extraordinary series concerts I attended at Westminster Cathedral in London in 1988 as a tribute to Olivier Messiaen during his 80th birthday celebrations. I had been deeply involved in the metaphysical qualities of his music since the 1960s and my studies in the midst of the compositional 'avant-garde' as an observer in 1968 at the New Music Course with Karlheinz Stockhausen at Kürten and Köln. I witnessed in awe the extraordinary introduction of birdsong into his works. I had gone to the cathedral to hear a performance Et expecto resurrectionem mortuorum (1964) and Des Canyons Aux Étoiles (1971-4). The ethereal transports rose into the fathomless dark of the cathedral's vaulted nave, the planned mosaics had not been laid nor the space illuminated. His universe of sound carried me into an immanent world beyond the material, sometimes directly into contact with the force of Nature. I remember him walking down the aisle with his rainbow scarf gathered about his neck accompanied by the figure of Yvonne Loriod attired in flowing silk, floating past like a gorgeous bird of paradise, to play the Vingt Regards sur l'Enfant-Jésus. The celebrations also included a complete performance in the Royal Festival Hall of his extraordinary opera St. François, which the composer also attended. Performances of Messiaen are not common in Poland. L’Ascension (1932-33) was originally written for organ and is perhaps better known in that form yet it is possibly the most famous of his early orchestral music before the extraordinary masterpiece the Turangalîla-symphonie. In 1931 Messiaen had been appointed organist at L'Église de la Trinité in Paris and this work emerged from the inspiration he felt there. Much of his early orchestral music was conceived at the organ. There are four meditations in the orchestral version all of which are a testament to his Roman Catholic faith. Each movement has a sacred quotation attached to it. Oddly enough Messiaen did not like his work particularly and in fact almost disowned it. However the Tonhalle-Orchester Zürich under the Estonian conductor Paavo Järvi gave a fine and moving performance of great authority and religious feeling. 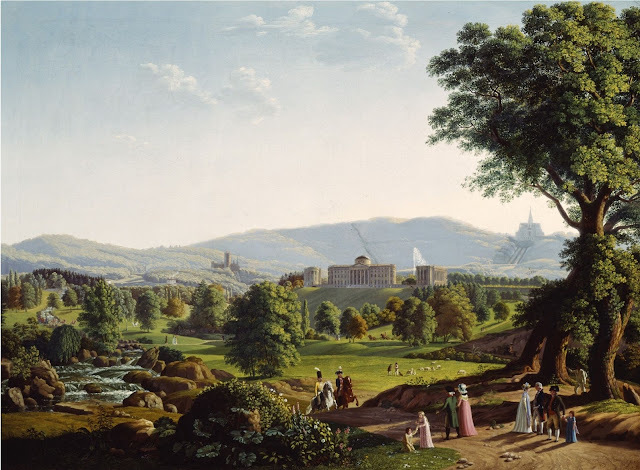 The Vienna of Mozart, the composer he adored above all others, drew Beethoven like a magnet. He was sixteen when he made his first journey there in 1787 and returned in 1792 ostensibly to study with Haydn. His brilliant keyboard playing caused many musical connoisseurs to consider him the second Mozart, unaware of his latent compositional genius. His revolutionary creative spirit soon outstripped Haydn. When he gave his first public concert on 2 April 1800 he included a Mozart symphony but failed to play this recently completed concerto, the C minor Op. 37 for reasons that remain obscure. My misfortune is doubly painful to me because I am bound to be misunderstood; for me there can be no relaxation with my fellow men, no refined conversations, no mutual exchange of ideas. I must live almost alone, like one who has been banished; I can mix with society only as much as true necessity demands. If I approach near to people a hot terror seizes upon me, and I fear being exposed to the danger that my condition might be noticed. Thus it has been during the last six months which I have spent in the country. By ordering me to spare my hearing as much as possible, my intelligent doctor almost fell in with my own present frame of mind, though sometimes I ran counter to it by yielding to my desire for companionship. But what a humiliation for me when someone standing next to me heard a flute in the distance and I heard nothing, or someone standing next to me heard a shepherd singing and again I heard nothing. Such incidents drove me almost to despair; a little more of that and I would have ended my life - it was only my art that held me back. Written at much the same time as the glorious 'Spring' Sonata for violin and piano Beethoven wrote that in this concerto he wanted to 'breathe new life into an old form'. The eminent pianist Rudolph Buchbinder and the Tonhalle Orchestra under Paavo Järvi gave as fine a performance as one might expect at this remarkably elevated level of mature, sensitive musicianship. 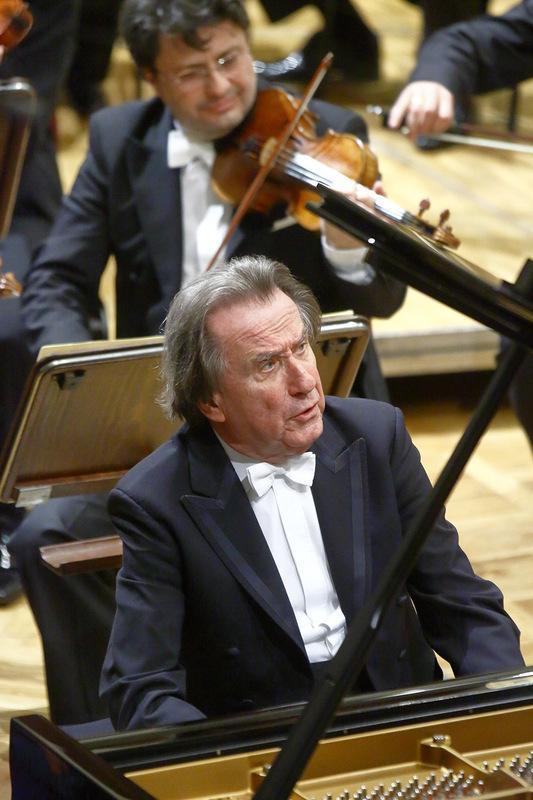 After the extensive orchestral exposition of the first movement Allegro con brio, Buchbinder opened with those immense C minor scales, scales that encompassed the entire keyboard for both hands and revealed him as the true virtuoso from a different era of superior pianism that he remains. Again as the development of the movement progressed, I was aware of seductive tone colour, the compete absorption of the classical style by both pianist and orchestra with his great variation in dynamic, breathing, phrasing and articulation. The monumental cadenza (integrated with the first movement as well as merging into the Largo) with its tremendous trill (reminiscent surely of Op. 111) was penetratingly authoritative. The heartfelt and expressive Largo was deeply moving. Here was an introspective, spiritually searching account. The colouration, the beautiful tone, the luminous cantabile and ardent phrasing always expressing emotion and sensibility organically from within. The highly virtuosic Rondo-Allegro finale revealed Buchbinder's formidable technique, the movement brought off with great élan and panache. The Tonhalle under Paavo Järvi were always perfectly co-ordinated with the pianist and the tight virtuosity of ensemble sound and command of classical style by all concerned an absolute and constant delight. The increasingly polyphonic nature of Beethoven's orchestral writing in this movement was well highlighted. We had by now moved from the dark, almost conventionally tragic, C minor onto the sunny upland pastures of C major, in a transformation of the musical landscape. This history of this too often neglected symphony is instructive. 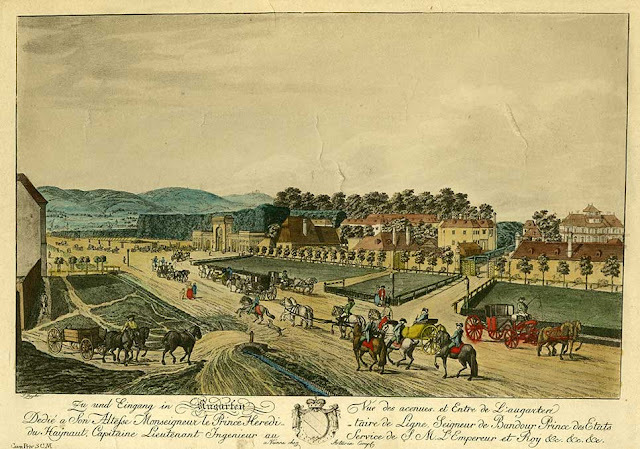 Beethoven left Vienna in the summer of 1806 to visit the ancestral Hungarian estate of his friend Count Brunswick at Martonvásár. Perhaps this relatively benign period of his life influenced the sunny nature of this symphony, although he was completing pieces of great emotional unease (the 5th Symphony, the Apassionata piano sonata, revising Fidelio, the Razumovsky quartets, the Violin Concerto and 4th Piano Concerto) and was constantly plagued by the terror of deafness. 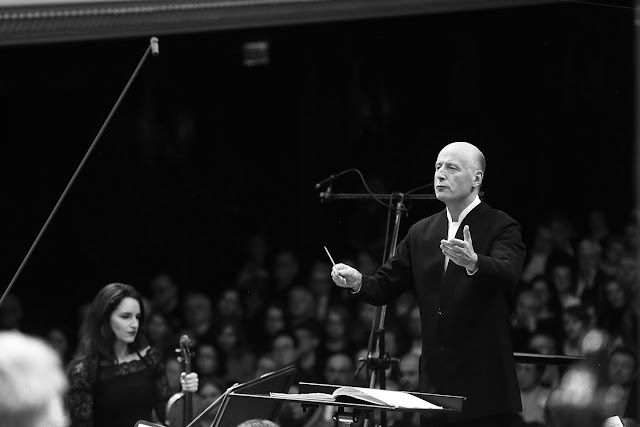 The Tonhalle and Paavo Järvi gave a superb performance of this symphony especially the mysterious opening, plumbing the emotional depths of the Adagio, expressing with pleasure the uplifting humor of the third Menuetto movement and adopting a well judged tempo for the energetic final Allegro ma non troppo. The ensemble sound of many fine soloists was immaculate and breathtakingly integrated. Any criticism of such an interpretation would be altogether too mean-spirited. In the opening Allegro ma non tanto one is aware of a sense of conviction and melodic expository self-confidence of the highest order rather than any of his later tragic or philosophical preoccupations. There is charm here and intelligent 'conversation' between instruments. In the second movement Scherzo: Andante scherzoso quasi allegretto the fugato opening is a delight of civilized Viennese gemütlichkeit which owes a debt to Haydn surely in its playful healthy demeanor, a smile of complicit private refinement across a chattering salon. The third movement Menuetto: Allegretto again calls up pictures in my mind of dancing figures both alluring and beguiling in splendid military uniforms and ball gowns. The final Allegro is in the cavalier Hungarian style that attracted Haydn. So stylish, full of élan and panache is the increase in tempo as the movement progresses, Hussar officers enjoying life to the full. Dare I say I feel the Shanghai take the life contained within the Op. 18 quartets rather too seriously. I feel perhaps they should enjoy their instrumental and musical interaction far more and communicate the pleasures of conversational light Viennese 'banter'. Surely this is the nature of many of the movements within the ebullient compositions of a carefree young man of emerging genius before the horrors of deafness and depression approached his soul. The work that followed the String Quartet in F major Op. 18 No.1 is in many ways the strongest in inspiration and underwent a number of revisions. It is particularly instructive to compare these versions. The structure of the quartet is as inventive, as is the overall ensemble sound rather revolutionary, compared to Haydn or Mozart. The tense and incisive writing suits the Shanghai particularly well as their extraordinary sense of ensemble and supremely accurate note duration, balance and attack is truly remarkable. In the second movement Adagio affettuoso ed appassionato Beethoven commented that he took Shakespeare's Romeo and Juliet as his inspiration. Surely no composer except perhaps Gluck had plumbed the personal emotional depths of love's possible tragedy to this extent before his conception of this affecting and deeply moving movement. The Shanghai were extraordinary poignant in this movement, causing one to reflect on the musical and temperamental maturity of this so-called 'early' quartet. The third movement Scherzo - Allegro molto is unexpectedly rather calm and even humorous in its light-hearted, almost Viennese coffee house gestures. I do wish the members of the Shanghai Quartet actually engaged each visually and smiled at each other in extra-musical communication. As a member of the audience it is easy for a musician to forget that there is an inescapable visual element to their performance, certainly as interacting members of a 'conversational' democratic quartet. They gave the final Allegro tremendous rhythmic impetus perhaps even slightly too much but it carried one away with excitement with its virtuosity, clear polyphony, immaculate articulation and ensemble playing. The contrasting cantabile elements were invested with great sentiment and charm. After the interval the String Quartet in C sharp minor Op. 131. What can I possibly say of any true or lasting significance about this immortal work wherein Wagner described the unearthly opening fugue as 'the most melancholy sentiment ever expressed in music'. Even this remark does not do justice to the beginning which can really only be termed 'the dark night of the soul' on the face of the deep before the creation of man. Listen to it yourself is the finest advice I can offer, feel how it affects your soul and come to your own personal conclusions. Ludwig van Beethoven, this profoundly isolated human in ways few of us can contemplate, let alone survive, transformed himself though sheer spiritual courage, juggling the shifting kaleidoscope of his obsession with variation form, the desperate memory of past joys in the Presto, clouds across the face of the sun, games with rhythm and charm, the dance and the final assertive conclusion in the silence of the mind and senses. The Shanghai Quartet were as profound and spiritually penetrating in this masterpiece as one could ever wish, triumphant in the grueling journey from the ominous oceanic cave into the sunlit sea of acceptance. In the set of Opus 18 quartets Beethoven mastered the style of his predecessors and explored new domains of musical expression. The independence of the four parts is so much greater than in the works of previous quartet composers. This refined, subtle and gentle quartet (1798-1800) was the first he composed and was dedicated to Prinz Joseph von Lobkowitz (1772-1816). Even the slow opening of the Allegro is unique and the remainder of the movement flows with the ease of country brook through a field in summer. 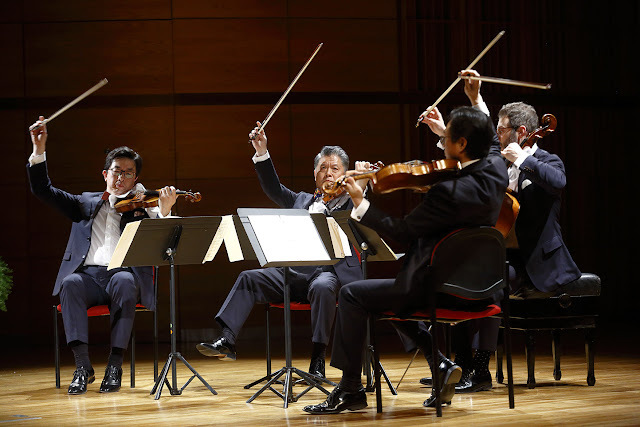 This was beautifully accomplished by the Shanghai Quartet. The Andante con moto second movement proceeded in the manner of elegant drawing room conversations of restrained emotion. Once again I felt the Shanghai could have captured the gemütlichkeit of this movement with more interactive and expressive geniality. The Scherzo (Allegro) was pleasantly unaggressive and replete with elegant gestures. I occasionally wish this fine quartet would approach the early quartets with less seriousness and more charm - seriousness is not their domain. Virtuosity yes, as in the final irresistible Presto movement Beethoven imbues with such impetus - this is where their energy and momentum shines. In the next work, the String Quartet in F minor Op. 95 entitled 'Quartetto serioso' by Beethoven for rather mysterious reasons, was composed in 1810 at the same time as the Egmont Overture. The tense, terse compactness of the short opening Allegro con brio suited the Shanghai Quartet to perfection. As did the extraordinary Allegretto with its inspired and highly musically sophisticated mixture of cantabile and fugato polyphonic elements. 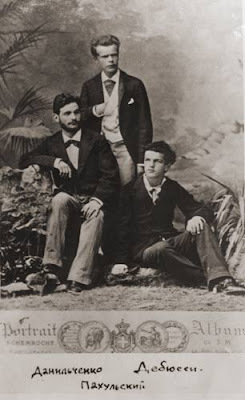 The abrupt, violent transition to the Allegro assai vivace ma serioso was almost frighteningly accomplished in its urgency and the powerful modulations were brilliantly accomplished by the quartet in the marvelous Trio. The fierce, irrepressible energy of Beethoven which always eschews languishing in depression suited the virtuosic command of these players so well as we moved on from the elegiac introduction through all manner of harmonic landscapes into the passionate even ecstatic and elated F major coda. Deeply satisfying performance of this extraordinary and galvanizing quartet. Finally the Quartet in A minor Op. 132 which is another of the Prince von Galitzin's commissioned set in 1822, one of which we encountered in previous concert (rather than repeat myself see Shanghai Quartet review below for historical detail Op.127 April 11). The Op. 132 Quartet was composed in the early part of 1825. Beethoven had begun writing the work but the process was interrupted by a serious illness. Dr. Anton Braunhofer treated his inflammation of the intestines by banning wine, spirits, coffee, spices and so on. He recommended a recuperation period outside Vienna in the fresh air and healthy environment of the countryside. 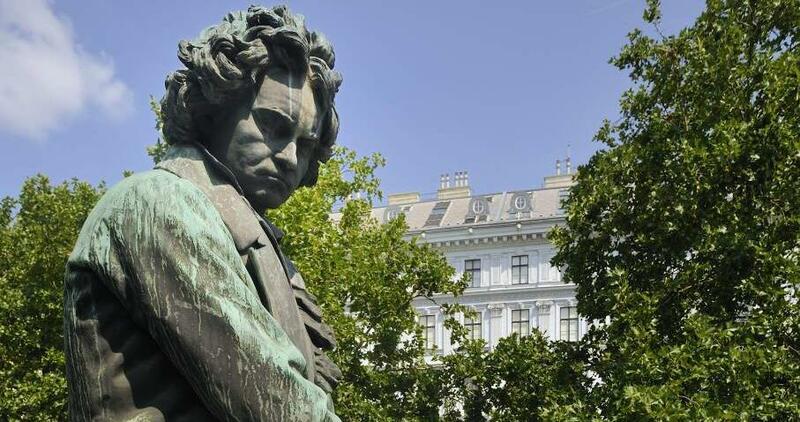 By May Beethoven had retired to the Viennese suburb of Baden and it was here the A minor Quartet was mainly written. This illness and recovery directly impinge on the inspiration of the quartet. The expressive heart of the quartet is the magnificent outpouring of faith in the third movement Molto adagio - Andante movement in the Lydian mode, the Heiliger Dankgesang (Holy Song of Thanks). 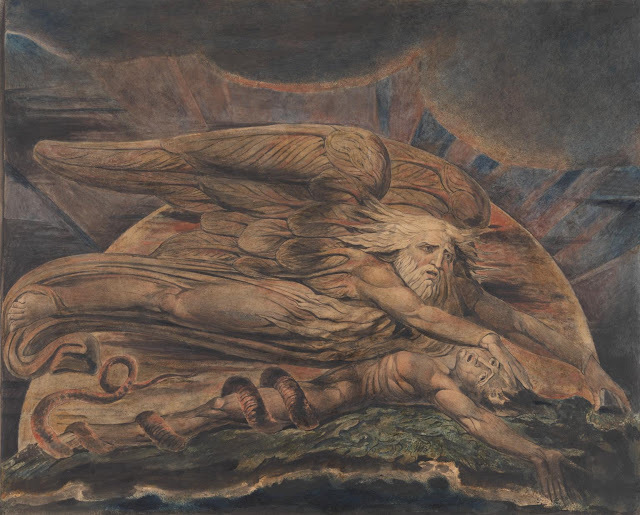 This was written as a gesture of thanksgiving for his recovery from this illness, a profound expression of his spiritual resistance or sublimation of his destiny of suffering - psychological, personal and concerning his blighted health. This sublime masterpiece of a movement, an enormous prayer of thanksgiving, is an otherworldly hymnal theme that achieves a type of joyful stillness written in an ancient church mode. Surely this immense statement is one of the greatest expressions of spiritual gratitude to the Almighty in Western musical art. The Shanghai Quartet expressed this deep seriousness with an incorporeal, immanent quality which was deeply moving. The remaining various movements orbit around this sun. The rough hewn opening movement Assai sostenuto – Allegro seems to betray a degree of attenuated anger against the burdens of fate. Melancholy and lyricism. The second movement is a minuet and trio as if preparing us to leave this material rural world for the profound Heiliger Dankgesang. This third movement hymn leads rather incongruously and almost shockingly into the brief Alla marcia, assai vivace which appears as if Beethoven wants to remind us of the secular triviality of the world around us - yet there is irony here rather than humour. The final Allegro appassionato is a robust, muscular assertion of human life thrown in the face of the unavoidable divine decree of death. The tremendous internal energy and intensely integrated ensemble style of the Shanghai Quartet suited this assertive promulgation of the triumph of life, even if temporary, performed with unarguable authority and style. This was a clearly very carefully planned programme of interconnected composers, themes and events. Full of admiration. 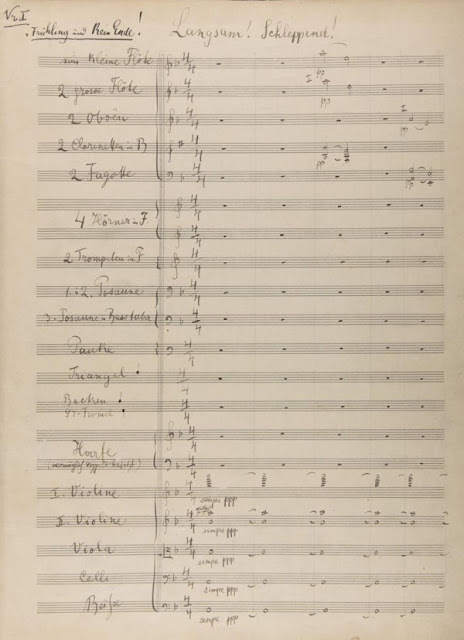 The Five Orchestral Songs Op.4, for medium voice and orchestra were composed by Alban Berg in 1911-12. Two were premiered by Arnold Schoenberg who taught Berg composition. The texts are taken from short rather eccentric texts by the contemporary Viennese poet Peter Altenberg and examine the soul under the influence of love and yearning. Berg set these texts for a large orchestra in a rarefied and deeply poetic minimalist manner. The composer of the opera Wozzeck ('...as vivid a projection of impending world doom as any to come out of the Great War...' Glen Watkins) and Lulu (the woman '...who became the destroyer of all because everyone destroyed her.' Karl Kraus) again portrays conflicted passions. 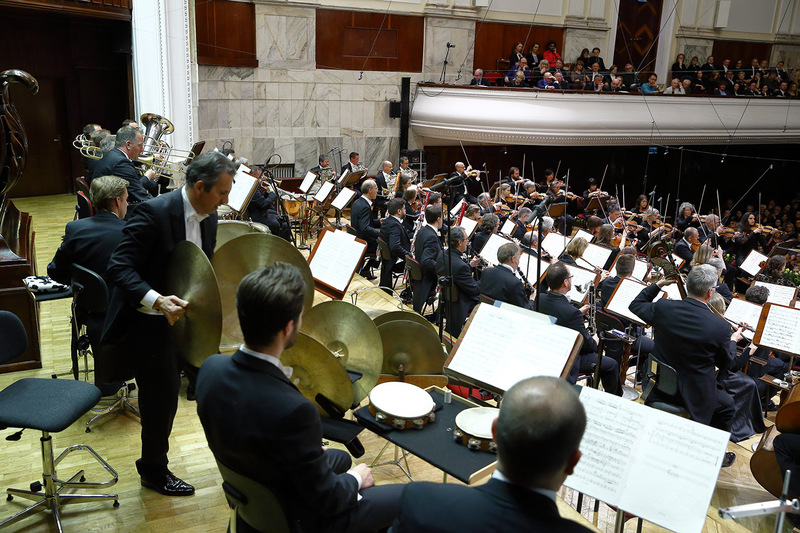 The so-called Skandalkonzert presented by the Vienna Concert Society occurred on 31 March 1913. This concert, which included the Altenberg Lieder and other 'experimental' expressionist works of the Second Viennese School (Zemlinsky, Schoenberg and Mahler), was conducted by Schoenberg in the Great Hall of the Musikverein. The shocked audience rioted and the concert ended prematurely. 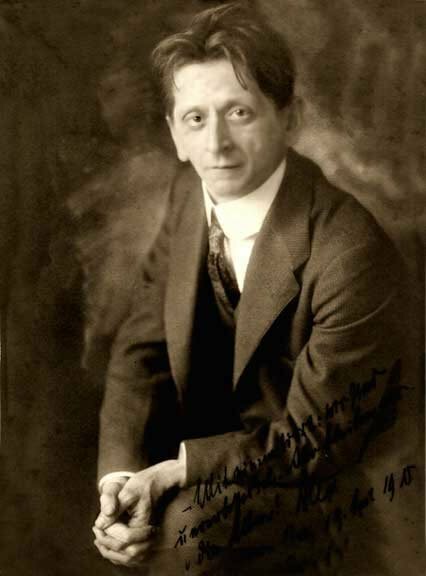 The operetta composer Oscar Straus considered a punch given by the concert organizer Erhard Buschbeck as the most harmonious sound of the evening. 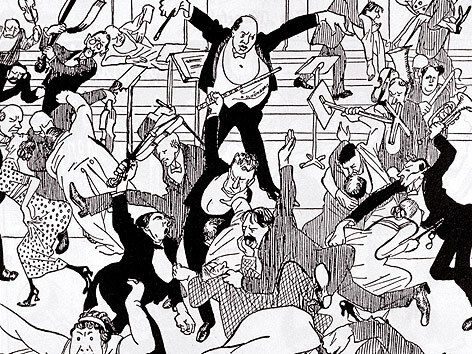 The riot following the premiere in Paris of Stravinsky's Rite of Spring occurred just two months later. How refreshing it would be if audiences today were possessed of the knowledge and passion to feel as strongly about classical music to protest so spectacularly. Also if a contemporary composer produced a work that affected people so deeply that they became outraged at the new vision. All great art is subversive in my opinion. 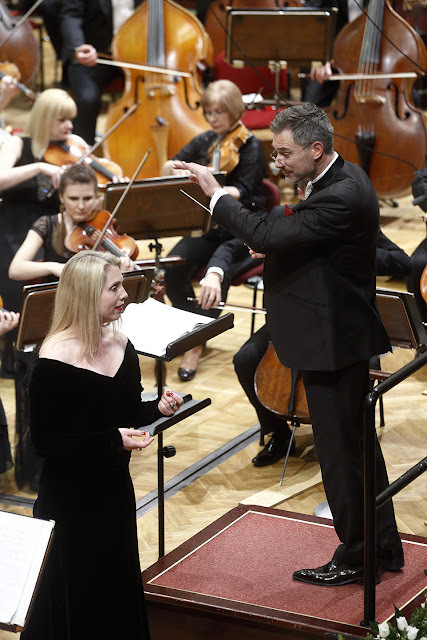 Aga Mikolaj and the Polish National Radio Symphony Orchestra in Katowice under Alexander Liebreich gave a superbly artistic and emotionally moving performance of this remarkable work. Faultless and inspired. This was followed by another deeply introspective cycle of love songs by Gustav Mahler, the Lieder eines fahrenden Gesellen. They were composed around 1884-85 as a catharsis for his unhappy love for the soprano Johanna Richter whom he had met while working as a conductor at the Kassel opera house. Mahler wrote the texts for this, his first mature orchestral song cycle, modeling them on the Das Knaben Wunderhorn, a collection of German folk poetry. We take an emotional rather Schubertian 'Spring Journey' (one of the delightful recurrent seasonal themes of the Beethoven festival) with a young 'journeyman' who is in despair having lost his love to a rival. In this performance I felt that the inspired conductor Alexander Liebreich was deeply immersed in this work and its haunting poetic world. However I believed that the baritone Raymond Ayers could have communicated more intensely the terrible passions unleashed in the heart when love or a lover is betrayed, abandoned. Mahler throughout his compositions opposes the embracing of life, joy and nature with the dark skeletal grasp of despair, emptiness, and death. His best known work is the Lyric Symphony which he wrote between 1922 and 1923. The work is in seven connected movements and is scored for baritone and soprano with large orchestra. The texts are taken from The Gardener (1915) by the great Indian poet, writer, artist and dramatist Rabindranath Tagore (1861-1941) in a German translation from the original Bengali by Hans Effenberger. Tagore was the author of the wonderful poem Gitanjali for which he was awarded the Nobel Prize for Literature in 1913. My deep, deep enthusiasm for your lyric symphony . . . must be acknowledged even though I now possess only a glimmer of the immeasurable beauties of the score. Yes, I would like to say, my decades-long love for your music has, in this work, received its fulfillment. A fine (if rather exhausting) performance of this demanding work by all the courageous artists concerned, the orchestra and conductor - deeply impressive in terms of emotional range and compositional genius. A composer I will certainly explore further. The renown of the Shanghai Quartet in Europe, Asia, North and South America and Australia needs little underlining. Their 34 albums, particularly of Beethoven, have been highly praised. 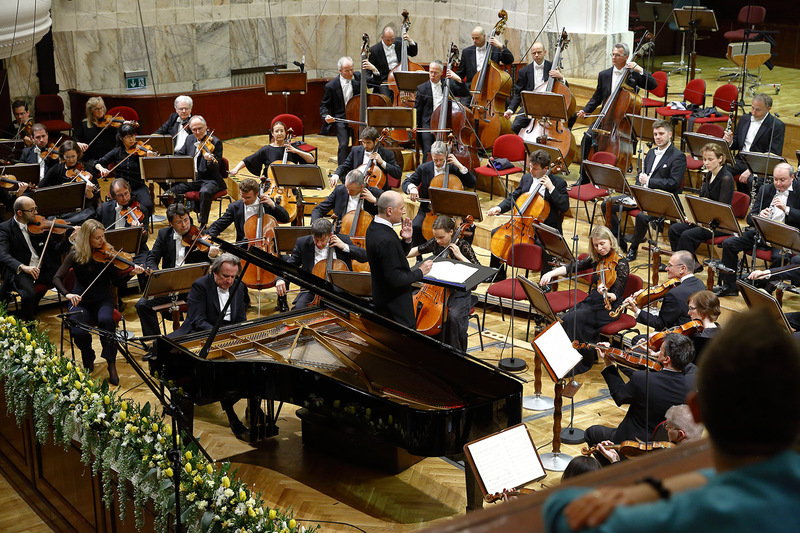 It is a privilege that they have agreed to appear so often during the Beethoven Easter Festival in Poland. The programme was arranged with some chronology in mind. They opened their chamber concert with the String Quartet in E flat major, Op. 127, which is perhaps the most accessible of the 'late' quartets. In November 1822 Beethoven was commissioned by Prince Nikolas Galitzin to compose a number of new quartets. Galitzin adored the music of Beethoven and was one of his most generous patrons. It seems almost inconceivable to the normal mind that Beethoven was at this time also completing the Missa solemnis and the Ninth Symphony, yet promised to deliver the first quartet by March 1823. Naturally enough this plan was delayed until late 1824. During the four grim years of life that remained to him, Beethoven concentrated exclusively on the quartet genre, composing three for the Prince and two that were not commissioned (Op.131 and Op. 135). The initial striking aspect of the quartet in those forceful, declamatory opening Maestoso chords of Op.127 was the fineness and almost perfect blend of the ensemble sound. The instruments seem so well attuned to each other and sensitively balanced, perhaps hardly surprising after so many years of playing together. The sound has a high burnish and the approach to Beethoven is fully laden with the excitement, electrical internal energy and high virtuosic efficiency we have come to expect of the classical style envisioned through the acute lens of a more modern world. The Adagio ma non troppo et molto cantabile is a serene set of variations. 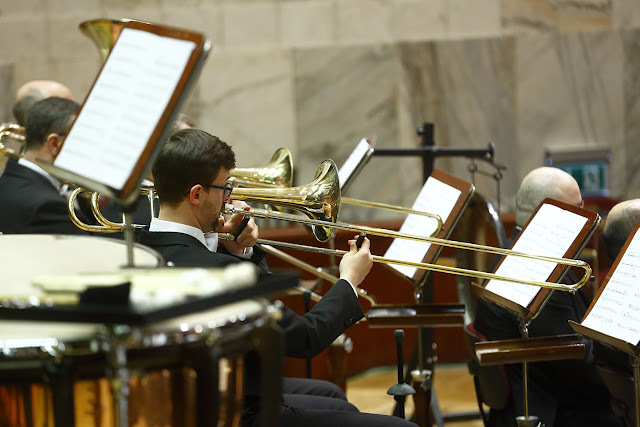 Despite the glorious sound, I felt on occasion the deeply poetic dialogues and ravishing theme between pairs of instruments could have been phrased more ardently and expressively. I had a need to penetrate further the emotional core of this movement, a longer breathed more moving cantabile line, a search for the desperate ache of emotional yearning that impels us so poignantly. Of course at this elevated level of performance, this is an observation with reservations at a very personal level, but one that accompanied me throughout their recital. In the Decker portrait gaze into the eyes that have witnessed internal emotional worlds beyond conception and at the grim determination of the mouth of this profoundly deaf composer of genius. Their virtuosic, mercurial style of performance suited to perfection the seemingly desperately joyful Scherzando - vivace - Presto. The Finale carried one along with the tremendous forward momentum of a Napoleonic cannon ball towards its target, the astonishing coda ultimately exploding in a fortissimo conclusion just as one felt one had escaped. Then to the String Quartet in G major Op. 18 No. 2 (1798-1800) considered an 'early' work. This is actually slightly misleading as the still young composer was thirty and had already distinguished himself as a composer of outstanding chamber works. The ebullient key of G major was favoured by Beethoven for conversational wit (especially in the Scherzo). This was coupled with a degree of rather untroubled melancholy emotion in the Adagio cantabile. The final Allegro molto, quasi presto is tremendously high-spirited with amusing multiple changes of key. The Shanghai gave a satisfying, exuberant performance but again I felt a need for more understanding of the historical context. I missed the rather robust, on occasion more civilized conversational even superficial 'banter' between members of the quartet, more 'fun' and enjoyment of this humorous music if you will. This could have been more effectively coupled with those telling gestures contained in the social affectations of the cultural milieu that Beethoven inhabited at the time. 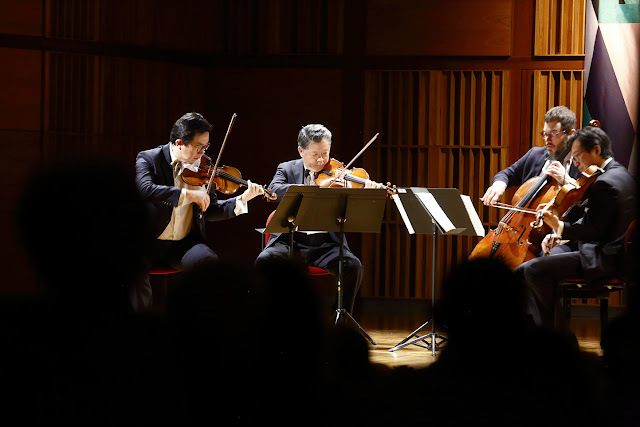 The period contextual understanding is also a quality too often missing from performances of the Haydn quartets where it can be so aesthetically and expressively delightful. After the interval a 'middle-period' String Quartet in C major, Op. 59 No. 3 'Razumovsky' (1806). This set shows a formidable development in style over the Op.18 set even after the relatively short period of 8 years. The Russian Ambassador to Vienna, Count Andreas Kirillovich Razumovsky (1752-1836) commissioned them. Razumovsky was a principal patron of Beethoven until his wealth was almost wiped out by a disastrous fire in 1814. 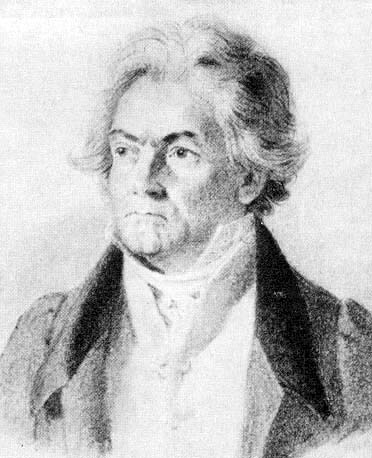 He maintained a permanent string quartet from 1808 to 1816 led by Ignaz Schuppanzigh (1776-1830) who played in many premières of Beethoven's works including quartets. Razumovsky himself, an accomplished musician, occasionally played second violin. 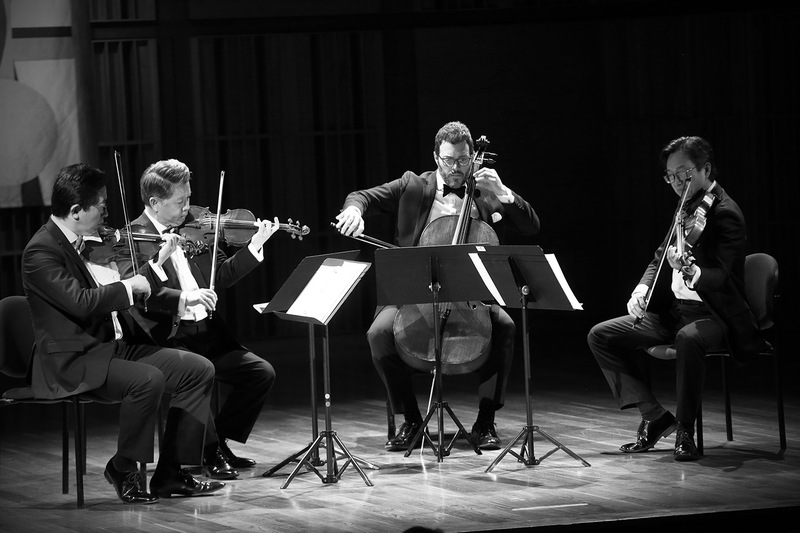 This quartet suited the virtuosity of the members of the Shanghai particularly well. 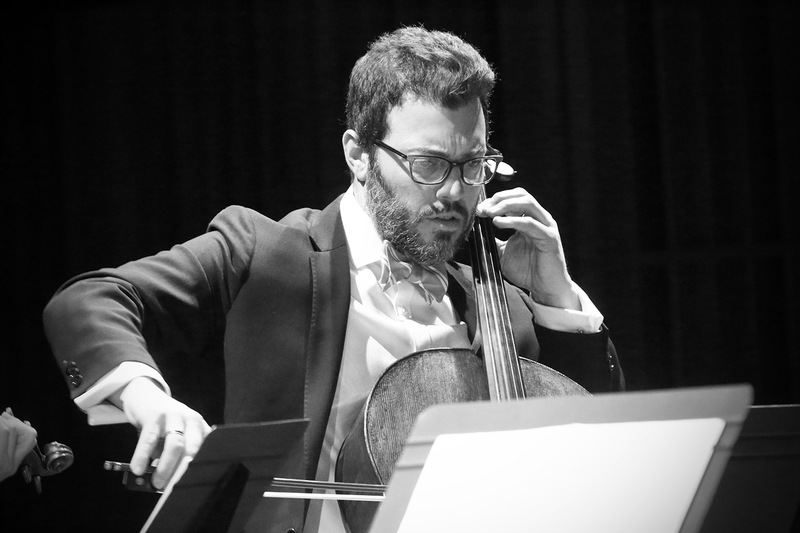 I was singularly impressed by the prominent cello writing in the second Andante con moto quasi allegretto movement and the almost slightly too aggressive pizzicato passages written for the cello. This melancholy movement was possessed of an eloquent although restrained almost bucolic folk character reminiscent perhaps of Central-Eastern Europe? One tends to forget just how far east Vienna is situated on the continent. The Finale was taken at a blistering tempo by the quartet, playing to their formidable strengths. Once again this highly burnished virtuosity was revealed that leaves one breathless and in awe of the musical coordination and cooperation required to bring the movement off with such spectacular élan and panache. 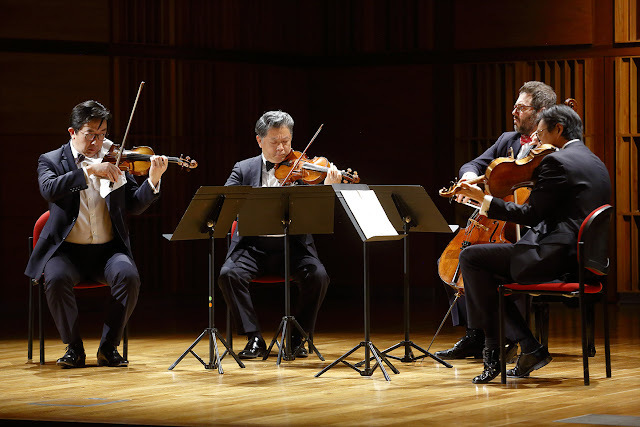 The Shanghai allowed the music to express fully the magnificent splendour of Beethoven in this quartet and one felt the composer himself would have been overjoyed. The principal […] field of Mr Moniuszko’s activity as a compose is dramatic music; his favourite genre is French opera, created by Gluck, refined with Italian improvements by Méhul and Cherubini, later enriched with the treasures of harmony and drama of the German opera, disseminated so widely by Catel, Boiledieu, Auber, Hérold and Halévy, the sounds of the French opera are heard today from the stages everywhere across Europe. Indeed, music of this kind seems to be much more to our taste than the studied, dreamy-philosophical German style: we are so fond of this gaiety, this lightness that does not exclude the true drama, melodiousness, grace and naïveté—the ingredients of the good French opera. This year is the 200th anniversary of the birth of Stanisław Moniuszko (1819-1872), the greatest operatic composer in the Poland of the nineteenth century. 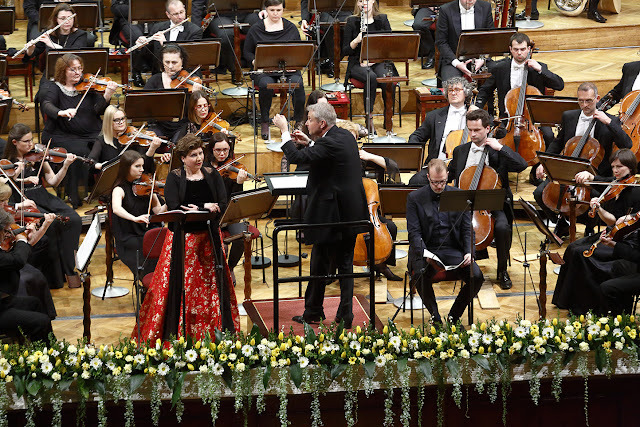 There are musical celebrations all over Poland and the resuscitation of long forgotten works in performance. Moniuszko was born into a family of Polish landowners settled in Ubiel near Minsk and showed the customary precociousness of genius. He studied composition and conducting with Carl Friedrich Rungenhagen in Berlin in 1837 and later worked as an organist in Vilnius. 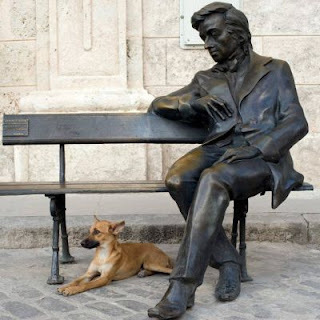 He traveled often to St. Petersburg where he met the great composers of the day (Glinka, Balakirev, and Mussorgsky) and also Weimar where he met Liszt and then Prague where he made the acquaintance of Smetana. In 1848 he visited Warsaw and met the poet Włodzimierz Wolski who became the librettist of arguably Moniuszko’s greatest operas, Halka and The Haunted Manor, both infused with the fertile theme of Polish nationalism. Halka was premiered with great success in Warsaw in 1858 and then later in Prague, Moscow and St. Petersburg. 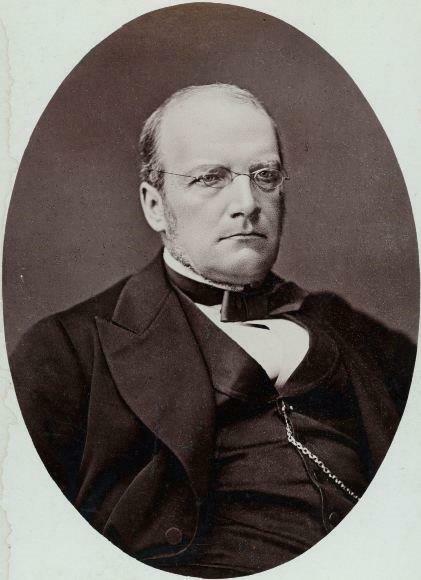 Moniuszko for some time had been fascinated with the class system in France as also the caste system in India as depicted in the play Pariah by Casimir Delavigne. He also desperately wanted an operatic success on the stages of Paris, spurred on by the successful operas of Meyerbeer. He had toyed with the idea of tonight's opera The Pariah for some ten years before it was finally premiered in 1868. This exotic opera is set in the Indian city of Benares (now Varanasi) on the sacred Ganges, perhaps the most important religious city in India for ritual cleansing and bathing in the waters of the river and the construction of ceremonial burial pyres for the dead. It is the tragic story of an impossible love that cannot overcome the deeply entrenched caste system of Untouchables and Pariahs in India. This performance was a concert version in Italian (originally in French but translated into Italian for the piano and orchestral version), which I cannot agree was the most effective way of presenting or resuscitating this largely forgotten opera. The significance of the exotic and culturally mysterious plot seems to have been undervalued in Poland and elsewhere on the continent since its premiere. This ornate tale would not have been considered minor and impossibly far-fetched in Great Britain under the hegemony of the British Raj. The cruelty and dramatic consequences of love struggling vainly against the caste system of Untouchables and Pariahs was well understood by the English as a result of colonialism and later even neo-colonialism in India. Many works of art deal with this fertile subject. The English literary masterpiece, the novel A Passage to India (1924) by E.M. Forster, deals precisely with the idea of two characters who by their actions and behaviour become pariahs within their own societies in colonial India, one in the English colonial society and one in Indian caste-constructed society. the humblest of all who were present, a person who had no bearing officially upon the trial: the man who pulled the punkah [a hand-operated large Indian ceiling fan]. Almost naked, and splendidly formed, he sat on a raised platform near the back, in the middle of the central gangway, and he caught her attention as she came in, and he seemed to control the proceedings. He had the strength and beauty that sometimes come to flower in Indians of low birth. When that strange race nears the dust and is condemned as Untouchable, then nature remembers the physical perfection that she accomplished elsewhere, and throws out a god—not many, but one here and there, to prove to society how little its [caste] categories impress her. This man would have been notable anywhere: among the thin-hammed, flat-chested mediocrities of Chandrapore he stood out as divine, yet he was of the city, its garbage had nourished him, he would end on its rubbish heaps. Pulling the rope towards him, relaxing it rhythmically, sending swirls of air over others, receiving none himself, he seemed apart from human destinies, a male fate, a winnower of souls. Another more modern novel The God of Small Things (1997) by Arundhati Roy, which was awarded the Man Booker Prize for Fiction in 1997, deals in part with the still savage exclusions of casteism among other social tensions in modern India. The Overture to Paria is a magnificent evocative piece of 19th century orchestral writing. 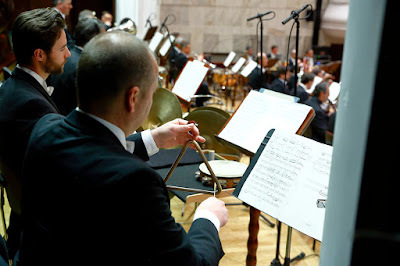 The Poznań Philharmonic Orchestra under Łukasz Borowicz gave a fine and spirited and lyrical account. Yet much criticism is leveled at the music Moniuszko composed for this opera as not being sufficiently dramatic, too 'Western' in idiom and influenced by Chopin and Wagner. However Verdi remained within the Western harmonic canon in say Aida (which predated Paria by only three years) with no significant criticism offered of his Italian musical style. He did however incorporate a tam-tam, gongs and other instruments with an Eastern timbre and associations. I am not sufficiently intimate with the music or the opera itself to judge with any discrimination what I felt to be a rather uneven performance that seemed to do little justice to its romantic heart. 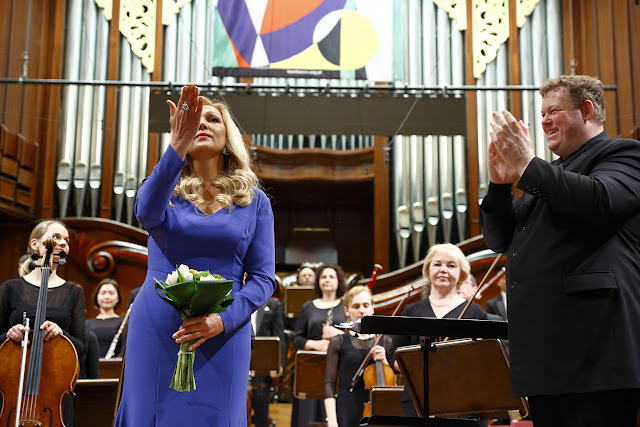 The soloists and choir were suitably accomplished and the soprano Katarzyna Hołysz is to be congratulated on her courage and voice command as a last minute substitution in what must be rather unfamiliar musical territory. Neala's renowned tragic aria of impossible love, 'Paria on Paria!" was particularly emotionally affecting with a most sensitive orchestral accompaniment. 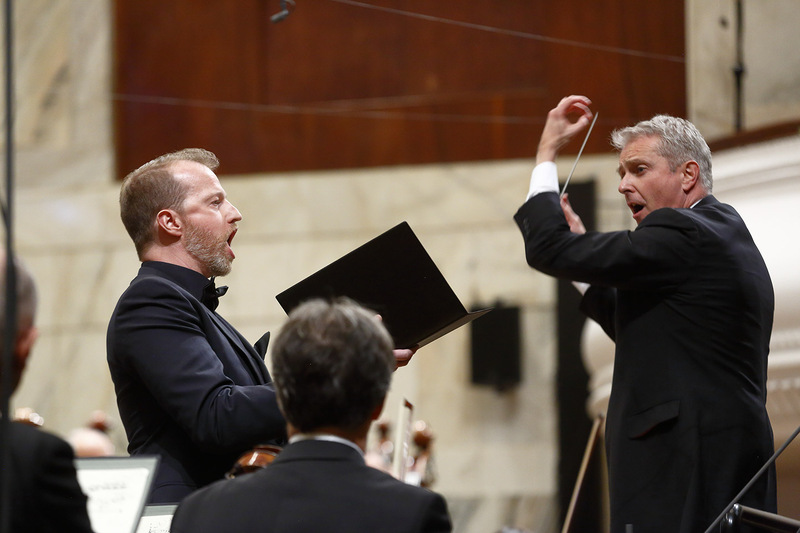 Szymon Komasa (Djares) baritone singing the spirited To on! Tak to on! with orchestra was tuneful and enlivening. 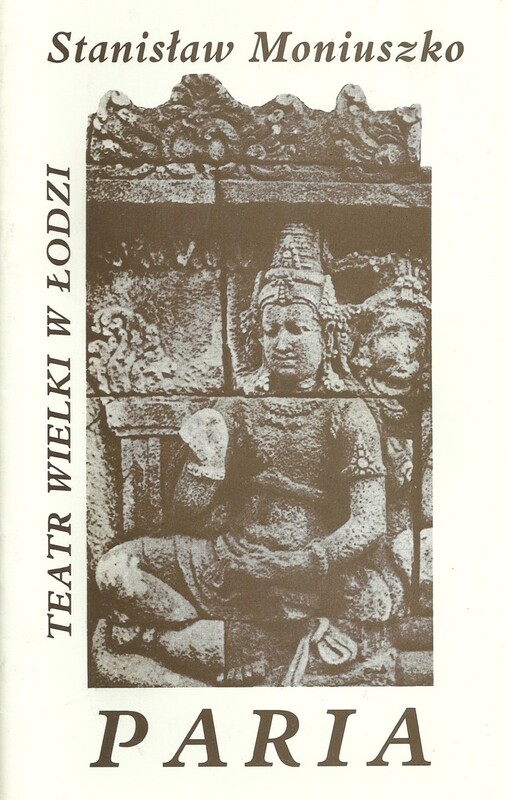 The Polish character of the Neala /Djares duets with the excellent choir, so well sung in the arias Znam gród wspaniały and Lecz próżno, ach próżno tak chodzę, was much in evidence but possibly a little inappropriate in this Indian context. Until at least 1989, the 'iron cultural curtain' effectively concealed the existence of Paria from opera directors, producers and audiences in the West. However I feel sure that an imaginative, fully costumed, opulent staged production of this exotic tale with fine soloists of world rank would at least partially fulfill and validate all of Moniuszko's own immense hopes for this his last and in his own opinion greatest opera. He was to die only four years later having failed to take his place on the wider European stage....of a broken heart? 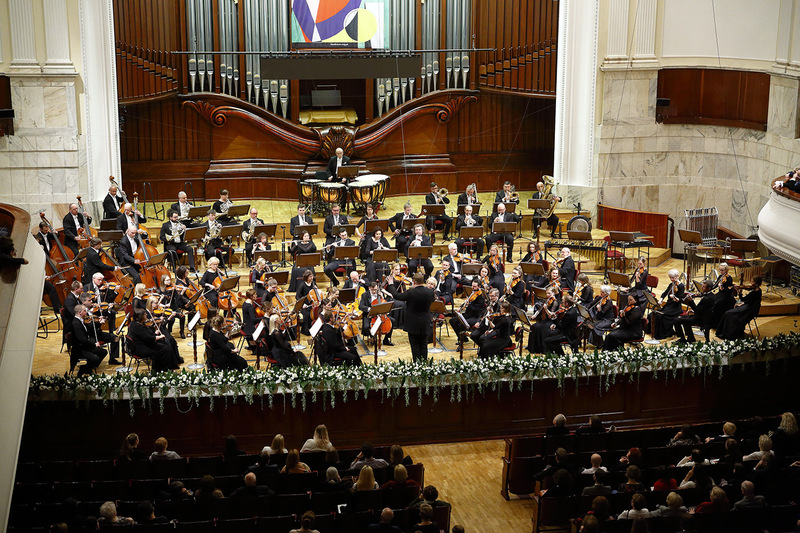 This year there are great musical celebrations in Poland marking the 200th anniversary of the birth of the national composer Stanisław Moniuszko. The seemingly impossible dream of the independence of the country as a sovereign nation and accession to the European Union means that at last what one might term the 'Cultural Iron Curtain' has been split apart to reveal to the wider world, formerly unknown artistic treasures of this valiant nation. In no domain has this been more obvious than in music, but also in art, architecture, theater and literature. This remark does not assume a forest of undiscovered composers of genius, but certainly many of enormous talent and significant musical gifts to augment the European musical canon. The very presence of the Korean Broadcasting System Symphony Orchestra playing a work by Stanisław Moniuszko is remarkable in itself. 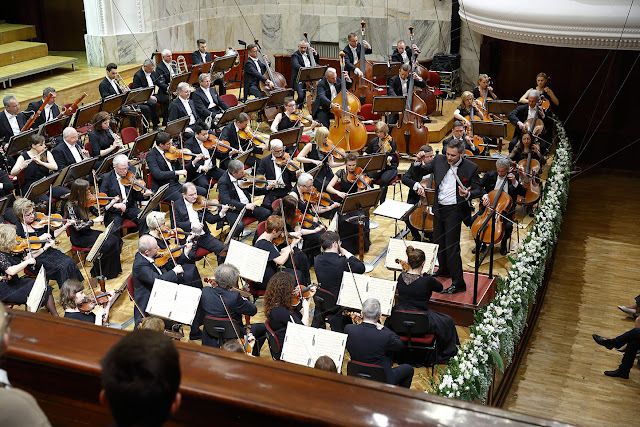 Halka is considered to be the Polish national opera and the overture one of his finest orchestral compositions. The melodies and lyrical character of the opera are affecting in this tragic simple story: the highlander girl Halka has fallen deeply in love with the aristocratic but feckless and faithless Janusz who cruelly abandons her to marry the daughter of the great landowner. Jealousy and self-sacrifice abound throughout this tale of the universal emotions of blighted love. The scenes in nature, the dancing of the Gorale mountain folk and the depiction of the nobility of the the Polish aristocracy (the szlachta) come together in a fine introduction to the nature of Polishness. This was a strong but not noticeably idiomatic performance. 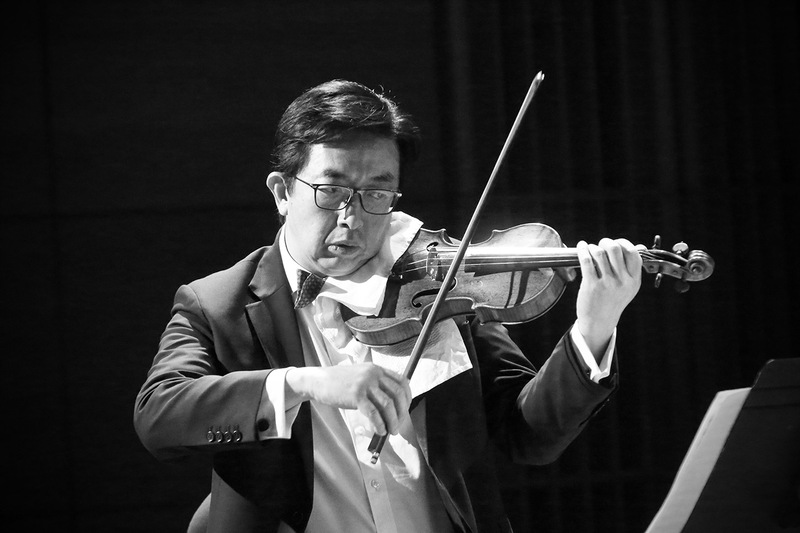 The next work was by the South Korean composer Jeajoon Ryu (b.1970), his Concerto for Piano and Orchestra. Mackenzie Melemed was the soloist. Ryu studied composition under Krzysztof Penderecki at the Krakow Music Academy. 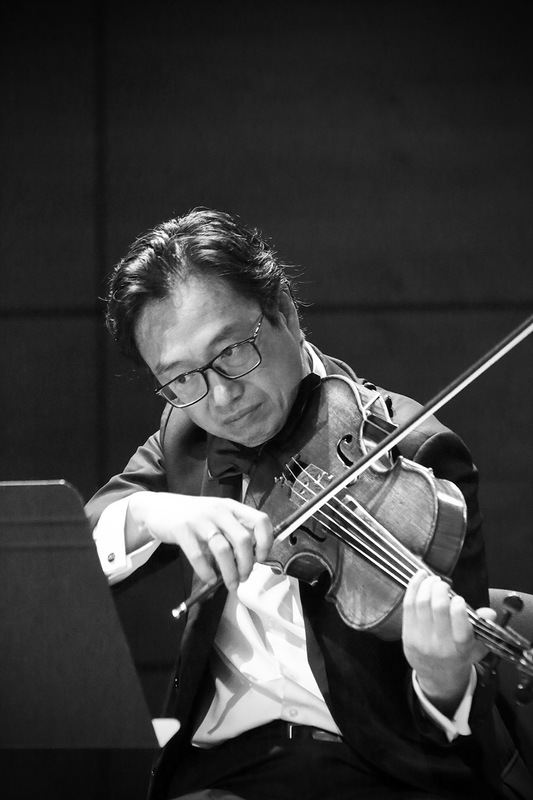 He is the Artistic Director of the Seoul International Music Festival in Korea and has been decorated with the Gloria Artis medal by the Polish Minister for Culture. The concerto in one movement opens with a sound reminiscent of the Maurice Ravel piano concerto. The texture I found called up n my musical memory the sound of the gamelan orchestra I heard in Indonesia although this was probably not his intention. The dominant piano part was written and mainly treated by Mackenzie Melemed as a percussive instrument at the forefront of an orchestral accompaniment. In this way the lack of melodic line and relative dynamic variation made the work unduly repetitive bug the sound texture was certainly glittering, bell-like and seductive - just a little excessive in length perhaps. The final work after the interval was the Gustav Mahler Symphony No. 1 in D major (1887-8). Rather than being mean-spirited and analyzing the various shortcomings and felicities of this performance, suffice to say that a great deal more thought and work by this orchestra must go into the conception of the enormous and ambitious work - particularly the true nature of the German Lied and rhythm of the Ländler. As with so many great musical works, the historical and cultural context surrounding the work and its performance must be deeply understood and absorbed. This, quite understandably, was not sufficiently accomplished. The chamber music section of this festival is usually of a very high standard and this afternoon's concert was no exception. The Penderecki Trio have a superb sense of ensemble and instrumental cohesion often playing as if of one musical mind, surely the sine qua non of any outstanding piano trio. One such as the immortal Beaux Arts Trio springs to mind. They began appropriately with the Beethoven Piano Trio in C-minor, Op. 1 no. 3. These were the first works that the composer graced with an opus number composed from 1794-5. 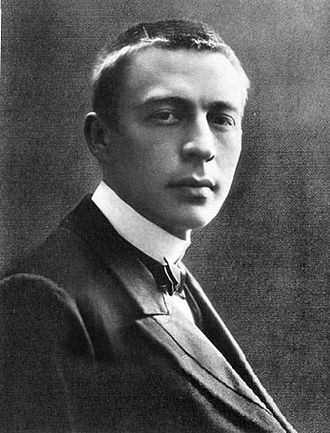 Prince Karl von Lichnowsky (to whom it was dedicated) was passionate about music and secretly subsidized their publication after the first performance in one of his weekly domestic soirées. It is rumored that Papa Haydn was present and was greatly impressed. This trio is certainly the finest and infused with the Viennese classical style. The Penderecki Trio expressed the grand harmonic ambitions contained within it superbly. 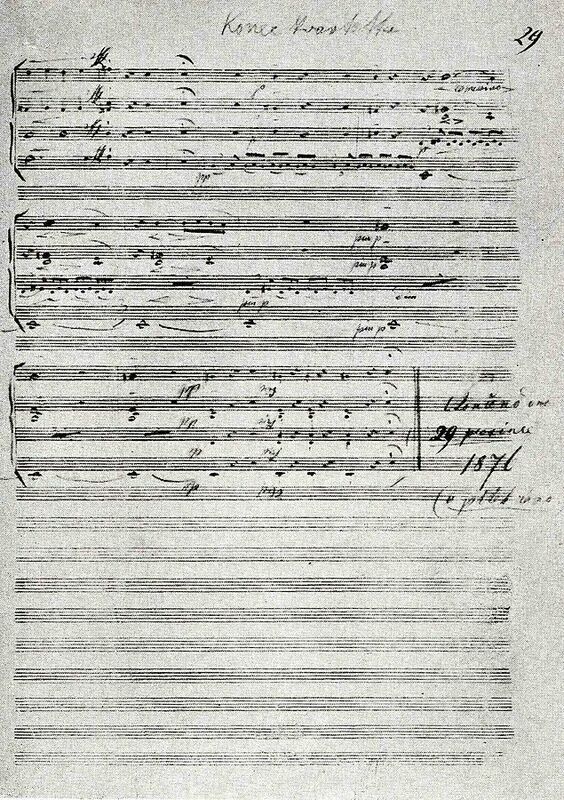 The first movement Allegro con brio possessed an unstoppable, Sturm und Drang spiritually relentless momentum, composed in one of the Beethoven's favorite keys for tumultuous expression, that of C minor. 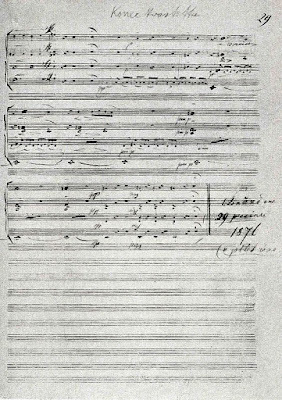 The second movement Andante cantabile con Variazione showed a complete grasp of the development of one of Beethoven's primary obsessions in the variation form. In the third movement the substitution of a Minuet for the Scherzo in the other Op.1 trios was performed with a certain carefree mood and then in the Finale Prestissimo clouds obscure the sun initially in C minor again in a rather frenetic mood. The conclusion seems as if a sort of filtered sunlight returns which was beautifully captured by the musical colours the trio effortlessly produce. This work was followed by the Sergei Rachmaninoff: Trio Élégiaque No.1 in G minor. The reasons behind its composition are not known and although composed in 1892 it was not published until 1947. As such it is rather a neglected piece with which I was not familiar. It has all the characteristics of Rachmaninoff compositional mastery in the manner in which the characteristically romantic Rachmaninoff piano theme is accompanied by undulating strings. 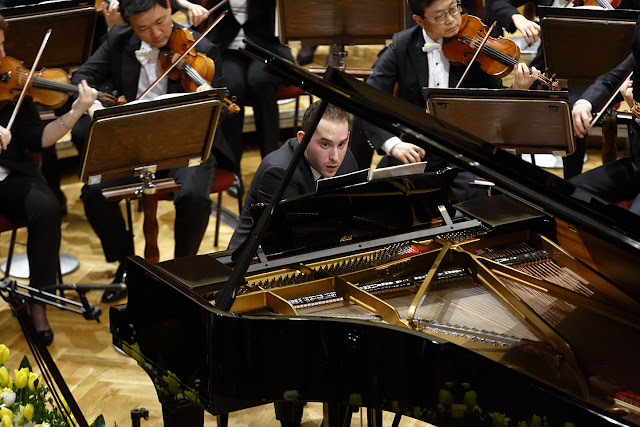 The pianist Konrad Skolarski is a fine musician with a close 'conversational' connection with the other members of the trio. 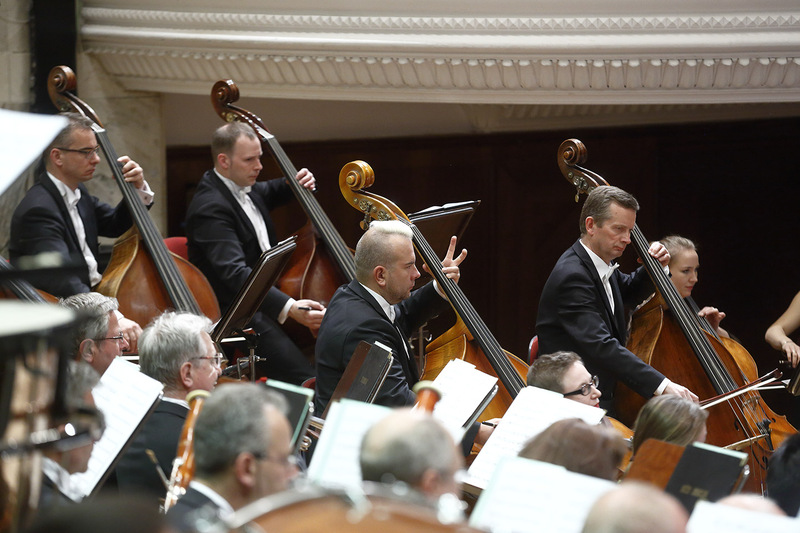 I was emotionally moved by the yearning emotions contained within and the fine fine singing cello lines by Karol Marianowski and the answering emotional range of the violinist Jarosław Nadrzycki. Finally the emotionally languishing Claude Debussy: Piano Trio in G major. This teenage composition written in glorious Fiesole in Italy in 1880 is rarely performed in concert. I do not share many critics dismissal as 'salon music' and nothing more. Certainly one would scarcely dream it was Debussy given its whiff of sentimentality. I found it thematically a youthful not too serious, pastoral love song, ardent in the first Andantino con moto allegro. The light-hearted pizzicato Scherzo was captured elegantly and with wit by this highly talented trio. The winsome third movement Andante expressivo as performed sensitively and with French refinement by the trio moves the sentiments in an undemanding manner and is none the worse for the lack of the dark night of the soul - we do not always want to reside in those regions where the darker passions prevail. The Finale - Appassionato inhabits the same realm of agitated sentiments. 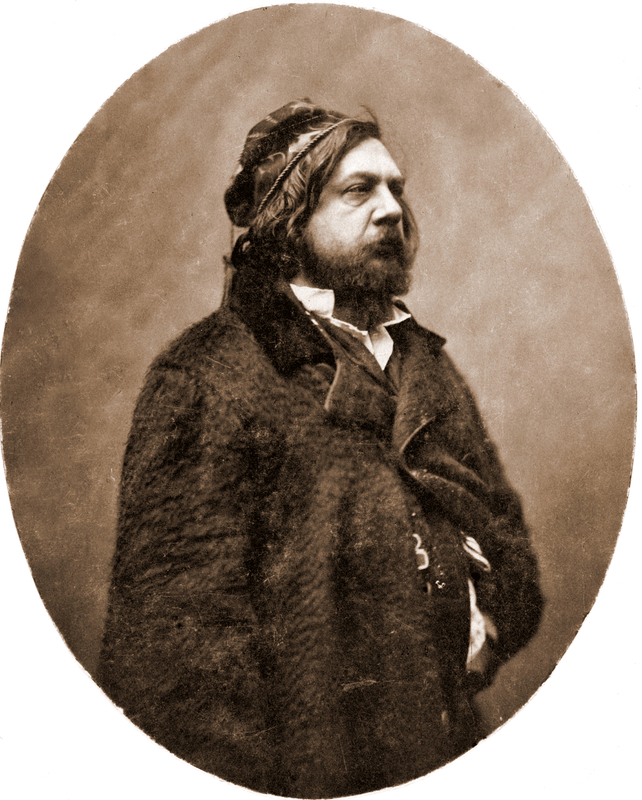 Debussy aspired to lightness and clarity in his music which is apparent even here in such an early work. I am reminded of his later characterization of the ideal of French music as generating ‘emotion without epilepsy’. 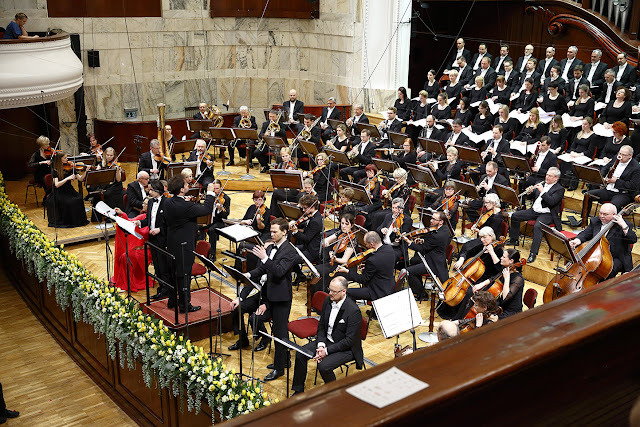 The inaugural concert of the Beethoven Easter Festival Warsaw Filharmonia apart from the distinguished presence of the Polish composer Krzysztof Penderecki and the founder of the festival Elżbieta Penderecka, the hall was replete with distinguished citizens from all walks of Polish life - their Excellencies foreign ambassadors, distinguished politicians, businessmen, industrialists, middle class professionals and of course humble music lovers like myself. The introductory speech in both Polish and English (a welcome gesture towards the international audience) was intelligent, well judged and mercifully short. The concert opened with the intensely romantic explosive nature of the Coriolan Overture Op.62. 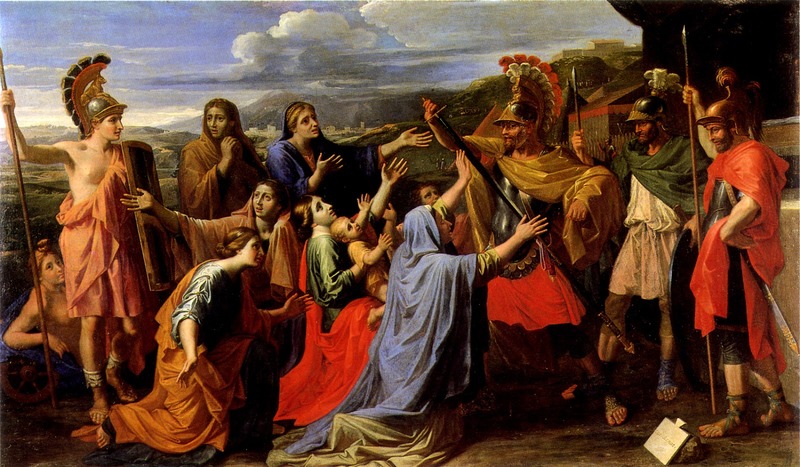 This was composed by Beethoven in 1807 for the tragedy Coriolan by Heinrich Joseph von Collin in 1804. Although dealing with the same possibly historical figure, there is no connection with the plot of the play Coriolanus by Shakespeare. Gaius Marcius Coriolanus was a Roman general who is said to have lived in the 5th century BC but is considered by some scholars have been a figure built from legend. He was renowned for his valour during the seige of the city of Corioli at that time inhabited by the Volsci tribe, rivals to the Roman republic. Later convicted of a crime against Rome, this turn of events meant he defected to his former enemies the Volsci and laid seige to Rome. His mother came to the gates and pleaded with him not to lay waste the city and he relented. However in an access of honour he committed suicide. Beethoven powerfully illustrates the shifting moods of these grand emotions. 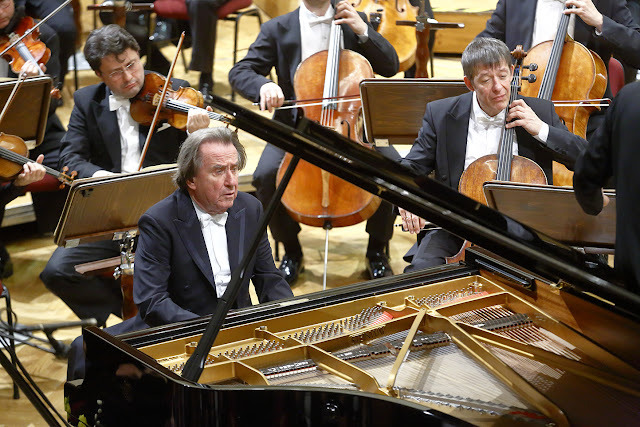 The performance for me was less passionate and the mood contrasts less exciting than I would have liked in Beethoven, such a master of wild and vivid dynamic contrasts. Unfortunately and certainly unfairly for the both orchestra and conductor I had in my inner ear the 1943 recording during WW II of Wilhelm Furtwängler and the Berlin Philharmonic. It opens with surely one of the most explosive and anger possessed fortissimos ever recorded, the tremendous and unstoppable forward inertia of the piece overwhelming in its passion, power and drama intertwined with the heartfelt and aching tenderness of his mother's pleas for mercy. Coriolanus wrestles internally with his grim destiny which battle is magnificently and profoundly expressed by Beethoven. Of course in this good performance we approached this imaginative and intense story through the music itself and it formed a fitting beginning to the festival. The work is essentially chamber music augmented by the orchestra, a piano trio in another more opulent guise. The dialogue is rather among the soloists than with the orchestra. For this reason I was interested to hear what these three young musicians would make of the work in a co-operative sense. The extended first movement was well brought off without the unnerving 'competition' that can result between outstanding virtuoso soloists. It was a shame I felt that the seating arrangements meant that Szymon Nehring had his back to the cellist and violinist which limited eye contact and the sense of interactive fun that can arise in performance. The second movement Largo was most eloquent on this mellow instrument and Latin temperamental commitment to the romantic cantabile melody that blooms like a spring flower. The final polonaise movement, Rondo alla Polacca, was a chance for the Pole Szymon Nehring to express his full understanding of the rhythms of this sparkling yet dignified dance and lead the other soloists. February 1838 was largely devoted to the composition of the overture to the virtuoso orchestral score for the opera Benvenuto Cellini. The overture became popular as an isolated concert work first heard in that form on February 6, 1840. Berlioz performed it in his concert tours whenever he encountered an orchestra that could cope with its fierce instrumental range and demands. There are a number of references to the magnificent scene where Cellini confronts the Pope and attracts forgiveness for his wild temperamental forays - pizzicato after the tumultuous opening. The overture oscillates effectively between that characteristic voice of Berlioz's affecting orchestral poetry (reminiscent at times of Roméo et Juliette) alternating with his almost bombastic physicality. 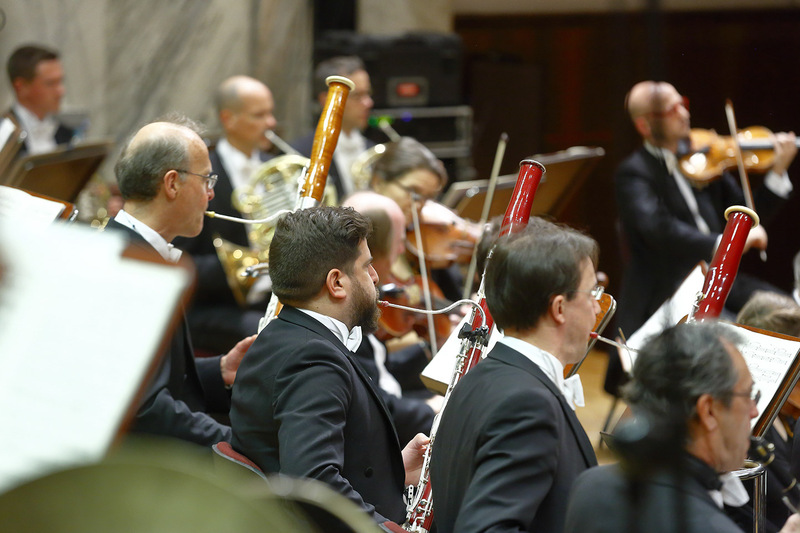 I felt under their conductor Lothar Zagrosek, the distinguished orchestra did not make nearly enough of the brilliant inner detail that characterizes Berlioz phenomenal orchestral palette and utilize more fully the instrumental distinction of the virtuoso soloists. Rather the 'broad strokes for stronger folks' overwhelmed the rather atmospheric contrasts with those scintillating inner polyphonic worlds Berlioz is a master of creating. He wrote the memorable "everything useful is ugly"
This is such a superbly romantic cycle of songs it squeezes the experienced heart in pain. Originally written in an inferior piano accompaniment in 1841, Berlioz orchestrated it between 1843 and 1856. The work has remained one of his most popular lyrical compositions ever since. The poetic spirit ranges from the intense flowering of love in spring, thorough loss and final rebirth. How appropriate to hear the Villanelle this April. Sing songs from the edge of their nests. In this performance I would have liked more refinement and delicacy in this simple folk ballad, the lighter joy and youthful exuberance of the blossoming of early love. The ghostly presence of the perfume of a faded rose is deeply affecting. That you wore yesterday at the ball. You carried me all evening. The poem is the lament of a Venetian boatman on the death of his beloved and the pain of sailing out to sea unloved. Here I felt the orchestral melancholy could have been far more expressive, pronounced, yearning and with more sensibility - passionate yes but the profound grief of restraint also lies here. These observations could be equally made for the impossible return of his lover. Come back, come back, my beautiful beloved! Far from your bright red smile! The joy of renewed hopes, overwhelmed by imaginative flights for the now unattainable in love. 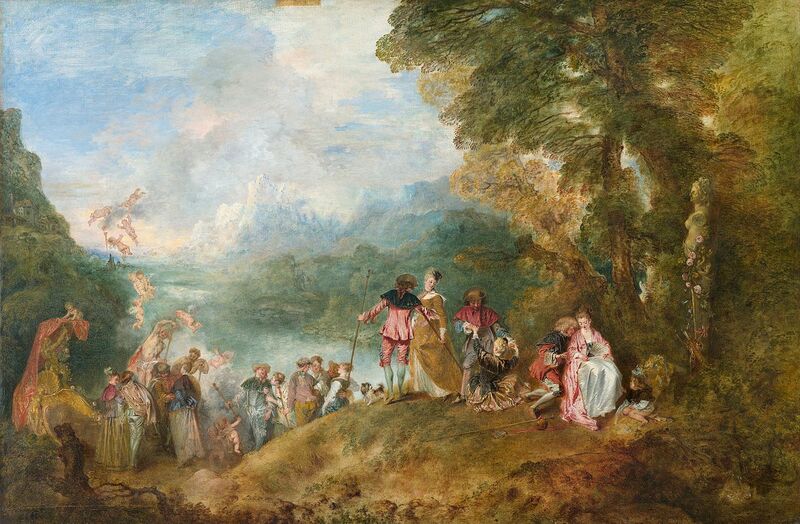 Surely Berlioz had in mind the painting by Jean-Antoine Watteau so close to the sensibility enshrined in this glorious song - that of the aspiration for bliss and the azure heaven hovering above the island of love. Stéphanie d’Oustrac came close to expressing this aspiration for love's ecstasy, tantalizingly out of reach except in the world of dreams. Where one loves for ever! In the land of love.